Warren Buffett is famous for saying that he does not invest in Tech companies because he doesn’t understand them and cannot predict what they will do in ten years. He may be a whiz with stocks and insurance companies, but can a Techie like myself really learn a lot of value from him? 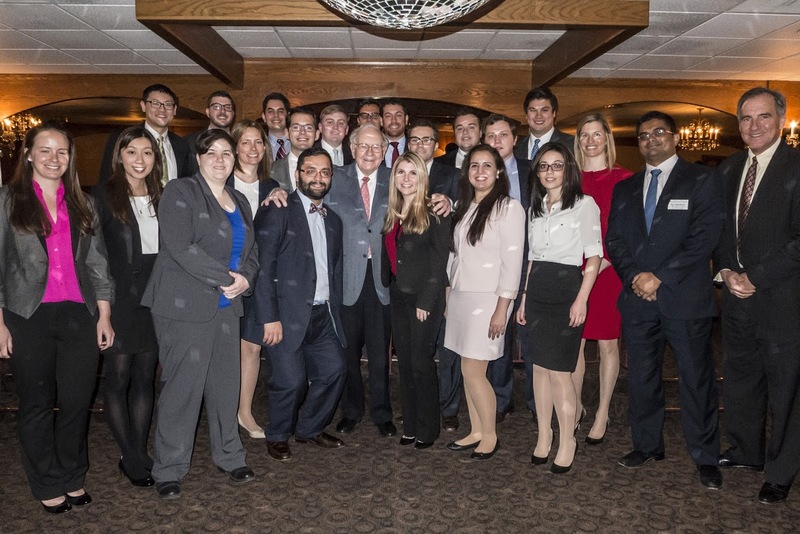 Recently, I had the opportunity to attend the Warren Buffett Experience with a group of MBAs from BC and five other schools. I met the Oracle himself and we had a 2 hour Q&A (with a tasty chicken parm thereafter). It turns out the answer to my question is a resounding YES! Buffett spoke very little about investing in particular and more about general business and life lessons as applicable to Tech as they are to Textiles (the business from which his Berkshire-Hathaway holding company gets its name). I have pages upon pages of notes but will do my best to summarize some of the highlights here. Buffett spent a lot of time highlighting the fact that we had all won the ovarian lottery just by virtue of having the minds, opportunities, families, etc. that allowed us to be in that room. In light of this, he told us he never really worries about mistakes–that it would be a mistake to complain about anything when you’ve already won on 80:1 odds at birth. He highlighted a failure to use your skills and talents to their full potential as one of the few real mistakes you can make. In today’s tech world especially, there are almost limitless free resources out there to make any idea a reality. Likewise, we have developed a culture that encourages trying, failing, and learning, over the safer routes. With opportunities like this, the biggest mistake we can make is not following our passions and starting a company, joining a startup, or otherwise following our passion. Buffett suggested taking the job you would choose if money were not a concern–for many of us, that means the startup world. If You Could Choose The System You’d Be Born Into, What Would You Choose? In explaining how he formulates his political opinions, Buffett suggested imagining that just before birth, a genie came to you and said you could design any system for society you wanted to born into with the catch that your lot (where you are born, to whom, with what capacities, etc.) would be a random selection of the 7 Billion people in the world. What kind of system would you design? I think this is a great way to think about society, but also valuable for entrepreneurs creating a company culture. Sure you want to create the kind of work environment in which you thrive, but you also need to imagine that talented people come in all varieties and you want to create a company culture that cultivates a diverse group of talented people whose differences can actually drive your company forward. Buffett spent a decent amount of time talking about women and how relatively brainwashed and underutilized they have been historically to the detriment of our ability to progress. This is changing, though not as fast or with as much support as it should be. Buffett suggests that anything objective such as investing is a great equalizer. Tech has progressed in an amazing way over the last few decades but like the US, it has done this largely using only about half of our talent. Many companies see hiring women as an important way to improve their PR and escape some of the accusations the Tech industry has been facing, but I think Buffett puts it in great perspective. Hiring women helps ensure that you get the absolute best talent as you are pulling from an applicant pool that is now double the size! Buffett spent a lot of time talking about the importance of developing good habits and eradicating bad ones when you are young. “Getting older and richer accentuates your qualities, good or bad,” he said, “so you want to make sure you start with ones worth amplifying.” He suggested one way to do this is to identify the person in your school, company, etc. upon whom, given the chance, you would like to take a long position. Now think about why you chose that person. Chances are the reasons are because of qualities they possess, and more than likely these qualities were developed not inherent. List them out and do your best to cultivate them within yourself. Conversely, figure out who you would short and why, then do your best to eradicate these qualities within yourself. In the Tech Industry, we are lucky to have many people we admire who are willing to talk, mentor, and even blog about their habits and the things they do to maintain their success. This makes it even easier to take Buffett’s advice and emulate the good while eradicating the bad. Furthermore, we can even take Buffett’s exercise a step forward to create a hire/don’t hire list over time. With such a fluid industry, chances are each and every one of us will have to face the task of building a team. The stakes here are high and in some cases may even mean life or death for a company. If you have already spent a lot of time thinking about this list, you have a leg up on the competition and a good starting point for building your team. Take A Few Hours Each Day And Imagine You Were Paying Yourself As A Consultant, How Would You Want Them Spent? At one point in the Q&A, Buffett pulled out a small planner from his pocket. “It drives Bill Gates nuts,” he said, “but I still do all my scheduling the old fashioned way in a planner.” He flipped through the pages showing a whole lot of white pages and not much else. “It’s mostly blank,” he declared, “and that’s how I like it!” Buffett went on to expound on the importance of free time, to read, to think, to be at your best. It reminded me of a blog post I read from Jeff Weiner where he talks about scheduling in blocks of nothing to his calendar. Buffett was careful to explain however, that this doesn’t mean watching tv but rather using your time in a high value way. He talked about how when his business partner Charlie Munger was originally practicing law and billing hourly, he would “buy” a few hours of his own time each day to do activities for which he felt would be worth paying his hourly rate. Buffett suggested using this mentality in regards to our own time. In a time and industry where we are always connected, protected time is hard to come by. Nonetheless, using our time wisely is critical for continued success in an industry that is rapidly changing and brings a constant onslaught of new competitors. Only by recognizing the value of our time and giving some of our chief hours to high value, personal development activities, can we hope to maximize the yield from our skills and talents. One of the last things Buffett said to us, was that, with very few exceptions, most people can literally double their success by maximizing their communication skills. These skills are key for getting people on your bandwagon and getting the full value out of your other skills. I think this was one of the single most tech applicable ideas he shared. We constantly hear about VCs who can make a decision on a startup within a few seconds of meeting the founders. With such a small make or break window, the ability to communicate is paramount. Elevator pitches, compelling presentations, and the ability to express your passion and value articulately make the difference between success and failure and yet, communication skills are rarely given the emphasis they deserve. On a recent visit to Boston College, VC Bijan Sabet talked about Runkeeper CEO Jason Jacobs and how he was competing against behemoths, initially with outsourced development, but that he was so successful in communicating his passion and vision, that Bijan knew it would be a worthwhile investment. Reblogged this on BC Grad Tech.